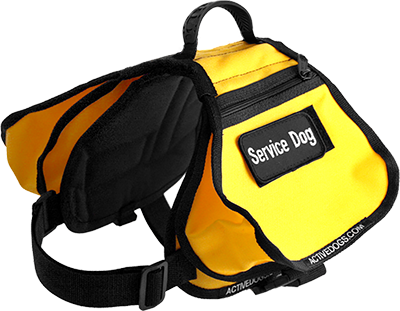 This item is two piece SaddleBag Harness Vest for your Service, Therapy, or S&R dog. This vest is loaded with quality and features. It is padded and made of two layers of weather resistant denier polyester fabric. The SaddleBag Harness is very easy to put on the dog as it fits over the dogs head and has one wide girth strap to snap shut. The harness is designed for comfort with wide straps and is lightweight with plastic slides and snap buckles. The harness is adjustable from 32” to 39” around the dog’s girth (over back, around chest, behind front legs). The harness attaches around the dogs chest with a quick-release snap buckle. The breast/chest (front of the chest under the neck) strap is a two way wide adjustable strap. There is a metal D-ring on the top of the harness so you can attach your leash or line to it. The Hook and Loop on top of the harness and on the bottom of the top of the saddlebags is a wide 3” so the saddle bags attach securely. The saddle bags not only attach with the Hook and Loop but also have snap buckles on the bottoms of each side so that when your dog is running or loaded unevenly the saddle bags stay in place and are not floppy in the wind. There are two zippers on the saddle bags one on each side of the bags. On top of the saddle bags there is a small reflective finger pull for easy pulling off of the saddle bags. The saddle bags are approximately 6”x10” so they are not as large as the backpack harness vest. There are no flopping belts on this saddlebag harness vest which tend to catch on objects. This 2 piece SaddleBag Harness Vest is perfect for traveling back and forth to work or that afternoon outing in the park. Vest comes with 4 regular (not specialty) patches free of charge.